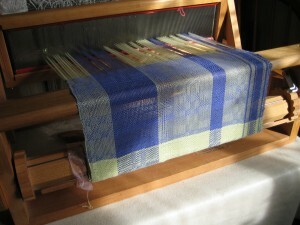 I’ve been weaving for about fourteen years, I think, but am still a beginner. Today I am thinking of the title Zen Mind, Beginner’s Mind and feeling good about staying a beginner. It means I’m always learning something new. I wove last year and Bronson lace that I plan to weave next. I used the same width and sett as the basketweave. I had read the chapter on huck in my book on woven lace but had not chosen which draft of in the chapter to use. So with the warp beamed, I looked through the drafts and found that I had to decide between three-thread or five-thread huck, huck spots or huck lace, and decide how many blocks, whether to include plain weave blocks, and how wide to make the blocks. None of the available choices seemed to fit exactly into the number of threads in my warp. I fiddled with various combinations and came up with a pattern of two huck and one plainweave blocks that fits with a little extra plain weave at each edge, one thread more at one edge than the other. I will remember this next time I wind a warp – not necessarily plan better, but at least give it some thought. I do like the element of surprise so I wouldn’t want things too well planned! Hold on to your beginner’s mind!